This poem is spillover from the July 3, 2018 Poetry Fishbowl. It was inspired by prompts from pantha, gingicat, sweet_sparrow, siliconshaman, bairnsidhe, antisocialite_forum, and chanter_greenie. It also fills the "volunteer" square in my 7-1-18 card for the Winterfest Bingo. This poem has been sponsored by the pool run by ng_moonmoth. It belongs to the Iron Horses thread of the Polychrome Heroics series. him warning twinges if he pushed it. after lunch when the phone rang. and then a scowl clouded her face. "I'll take care of this,"
Ida said, and hung up. a cloth across the table. the room like it was," Ida said. "I told him we'd help, of course." over a bar in the kitchen. put his place back in order," Ida said. "Yes, ma'am," Kenzie said crisply. and bring them here so I can deal with them,"
Ida said. "I will teach them a lesson." with him, but she looked really mad. about how we treat people, about manners." "Oh. Okay," Kenzie said. "That's good." took the RV to round up the kids. through low, rolling hills of green and gold. around it, bordered by tall native grasses. and a line of bushes rising into trees. the open door of the small den. spilling books all over the floor. they sat against the wall, looking guilty. to pick up the scattered books. the bookcase back in its place. Kenzie said, staring at the mess. a t-shirt that read, Mommy's Superhero. to sit his tail down. So this happened." hand them to Many Tongues,"
the bookcase where it belongs." "Okay," Kenzie said, hurrying to obey. and shooed them out of the house. looked like they belonged together. "Thank you," Many Tongues murmured. "I really appreciate all of your help." felt something metal under his hand. "How come this one's locked?" "That's from the top shelf,"
to work on that project now." "It is. It's also somewhat risky,"
what had happened with Mick. to leave fast enough," she'd said. "Sometimes both, if you're a raven." like a crow clutching a shiny stone. Yeah, Many Tongues might be both. like leather amongst the books. "Hey, what are these things?" 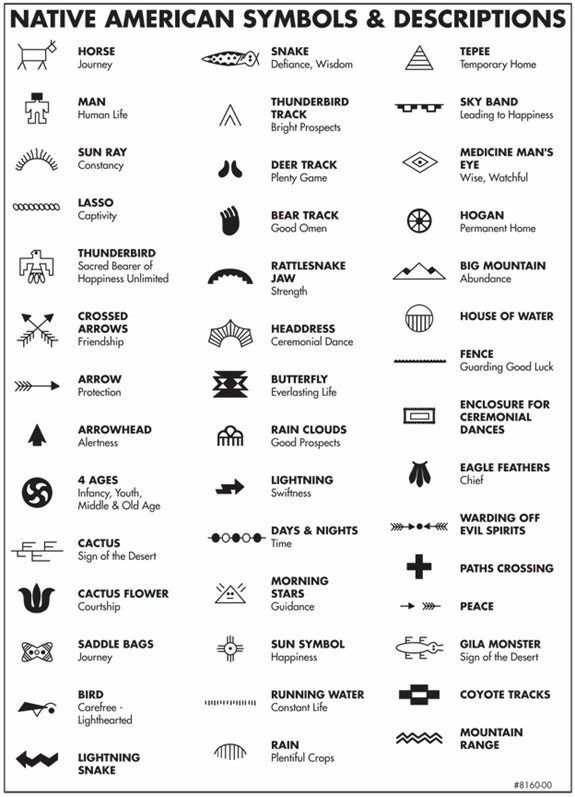 "They are story hides, practice ones,"
one and showed Kenzie a spiral of symbols. or it can be a calendar of many winters." "That's really cool," Kenzie said. when I went on a field trip to a museum." "Our histories do not belong in museums,"
here, in the homes of our elders." of script with loops and triangles. "What in the world is this stuff?" our languages. Blair knows it too." set the fallen bookcase upright. "My parents know a different dialect." "It must be nice," Kenzie said. re-rolling them with fussy gestures. ékoci óma éyakohk ésa ká-wanisiniyak." Ida had sent him to help. we are lost," Many Tongues translated. of the room and nodded understanding. "Sock talk mini witch talk?" he tried. housework." He waved at the mess. "I thought it fit. What's it mean?" one another," Many Tongues said. "Oh," Kenzie said. "I like that." "Do you now," the older man murmured. "Would you like to learn more about it?" of leather in his hand. "Could I? I'm ... just a guest here." to come and clean house!" "It's what we do with family." to this," Blair told Many Tongues. a language only lives if people speak it. Plains Cree, I'll be happy to teach you." earn your way in?" Blair said. "Yeah, I did," Kenzie said. "Well, you need 200 points for that,"
up to 50. That's a quarter of the total." another 10 points per year," Ron added. "In five years, you could halfway there." on top of his superpowers," Blair said. "He could be done in five years." that people are keeping the language alive like this." an inner strength and pride in your heritage." never cared much for him. in need of a wheelchair. than the ones he'd been born to. of that," he said softly. Beginning Cree," said Many Tongues. has something to practice reading." and passed it to Many Tongues. adding them to the growing stack. a lot of elders do those, just watch for them." "Thank you," said Kenzie. "I'll do that. Many Tongues said, patting him on the hand. what you just said," Kenzie admitted. the good things of life," Many Tongues said. the precious bundle underneath his arm. the ache out of his scarred back. "Then let's get you home,"
with that blue chamomile oil." then remembered why they were there. "The room isn't finished, though --"
"Don't worry about it," said Many Tongues. "You folks picked up most of it already. back in the right order by tomorrow." "Then yeah, let's go home,"
Ron as a walking crutch. to the truck without too much trouble. He fell asleep on the way home. Kenzie out of the truck. in Plains Cree, maybe in Chippewa. "The shadow is touching the stone,"
Mick said. "You are done with this chore. Now go inside and talk with your grandmother. are sorry for making a mess of his home." and scampered into the roundhouse. Kenzie followed at a slower pace. as she saw Kenzie come inside. full with these scamps for a while." to his room and lay on the bed. folding them neatly to set aside. then smoothed it over Kenzie's back. Kenzie gave a deep sigh of relief. "Don't worry about falling asleep,"
wake you so you don't miss supper." the long slow strokes on his back. an inner strength in this language. He let that thought lull him to sleep. Many Tongues (Theoren "Theo" Greyeyes) -- He has fair skin, gray eyes, and dark hair trimmed into a short mohawk. His heritage includes Cree, Chippewa, and British. He wears glasses. Many Tongues is a disabled Army veteran, paralyzed from the waist down, who uses a wheelchair. Because of this, he needs help with some everyday tasks. Many Tongues works at the Rocky Boy's Early Headstart language immersion program. He speaks A'ananin (Gros Ventre), Dakota (Sioux), English, French, Lipan Apache, Nakoda (Assiniboine), Nēhiyawēwin ᓀᐦᐃᔭᐍᐏᐣ or Plains Cree, Ojibwemowin (Chippewa or Ojibwa), Oji-Cree (another dialect of Ojibwa), Plains Indian Sign, Salish, and Siksika (Blackfeet). He is currently struggling to learn Diné (Navajo). He has chosen a mix of widely-spoken tribal languages and very rare ones. Âniskô-kiskinwahamâkêwin means passing on teachings. Etchemin Hunt -- He has copper skin, brown eyes, and short black hair. He is tall and broad with a squarish face. He wears glasses. He is the husband of Nuna and father of Kitchi (son, 8), Huritt (son, 6), Kanti (daughter, 4), Samoset (son, 3), Tihkoosue (son, 2), and Mukki (son, 4 months). His family lives on the Rocky Boy's Reservation in Montana. Etchemin builds canoes and other boats for a living. Kitchi Hunt -- He has copper skin, brown eyes, and short black hair. He is the grandson of Ida and Tomson Starblanket, son of Etchemin and Nuna Hunt, nephew of Blair Her Road Goes Both Ways, older brother of Huritt, Kanti, Samoset, Tihkoosue, and Mukki. His family lives on the Rocky Boy's Reservation in Montana. Kitchi is currently 8 years old. He loves to read, but often gets so absorbed in what he's doing that he forgets to pay attention to what's happening around him. Nuna Hunt -- She has light copper skin, brown eyes, and long straight brown hair usually worn in a braid. She is the daughter of Ida and Tomson Starblanket, older sister of Blair Her Road Goes Both Ways, mother of Kitchi (son, 8), Huritt (son, 6), Kanti (daughter, 4), Samoset (son, 3), Tihkoosue (son, 2), and Mukki (son, 4 months). Her family lives on the Rocky Boy's Reservation in Montana. She teaches preschool. Origin: Her superpowers grew in gradually. Motivation: To take care of her family. Samoset Hunt -- He has fair skin, brown eyes, and light brown hair cut short. He is the grandson of Ida and Tomson Starblanket, son of Etchemin and Nuna Hunt, nephew of Blair Her Road Goes Both Ways, younger brother of Kitchi, Huritt, Kanti, older brother of Tihkoosue and Mukki. His family lives on the Rocky Boy's Reservation in Montana. Samoset is currently 3 years old. Fast and curious, he is all but impossible to contain and constantly gets into things. He is just as happy to pick up a mess as to make one, though. Origin: His superpowers manifested when he learned to walk. Tihkoosue "Tick" Hunt -- He has pinkish-fair skin, brown eyes, and light brown hair cut short. He is the grandson of Ida and Tomson Starblanket, son of Etchemin and Nuna Hunt, nephew of Blair Her Road Goes Both Ways, younger brother of Kitchi, Huritt, Kanti, Samoset, older brother of Mukki. His family lives on the Rocky Boy's Reservation in Montana. Tihkoosue is currently 2 years old. He is patient and watchful, but typically clings to his mother rather than exploring. It gives him the nickname Tick. Sometimes their parents put him on a blanket with Mukki, and the two of them will just stay there. Kanti Hunt -- She has light copper skin, brown eyes, and wavy brown hair that she's trying to grow out with little success. She is the granddaughter of Ida and Tomson Starblanket, daughter of Etchemin and Nuna Hunt, niece of Blair Her Road Goes Both Ways, younger sister of Kitchi, Huritt, older sister of Samoset, Tihkoosue, and Mukki. Her family lives on the Rocky Boy's Reservation in Montana. Kanti is currently 4 years old. She enjoys crafts and has a sweet voice when singing. She feels a little left out as the only girl with five brothers, but she gets indulged more, too. Huritt Hunt -- He has light copper skin, brown eyes, and short black hair. He wears glasses. He is the grandson of Ida and Tomson Starblanket, son of Etchemin and Nuna Hunt, nephew of Blair Her Road Goes Both Ways, younger brother of Kitchi, older brother of Kanti, Samoset, Tihkoosue, and Mukki. His family lives on the Rocky Boy's Reservation in Montana. Huritt is currently 6 years old. He has his mother's loving touch with people, but little grasp of math or logic. 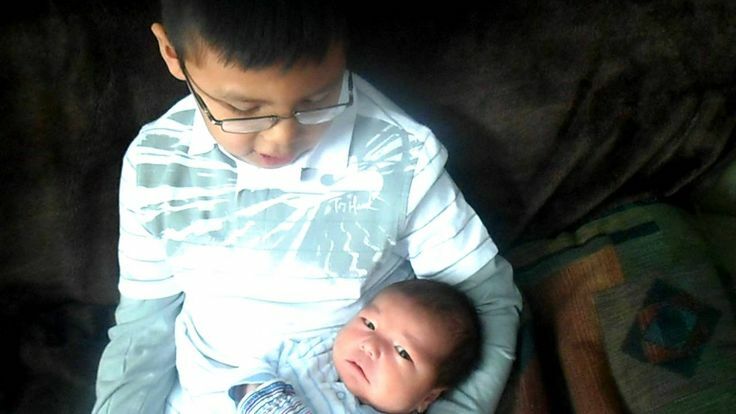 He is very attached to his brother Mukki and enjoys holding the baby in his lap. Mukki Hunt -- He has light light copper skin, brown eyes, and short black hair. He is the grandson of Ida and Tomson Starblanket, son of Etchemin and Nuna Hunt, nephew of Blair Her Road Goes Both Ways, younger brother of Kitchi, Huritt, Kanti, Samoset, and Tihkoosue. His family lives on the Rocky Boy's Reservation in Montana. Mukki is currently 4 months old. Fascinated by everything around him, he rarely fusses as long as he can see what's going on. If left alone, though, he squalls until someone picks him up. If he falls asleep that way, he wakes up, can't see anyone, and starts crying again. His relatives pretty much wear him all the time to keep him happy and quiet. Aside from his parents, Mukki is most attached to his older brother Huritt. Knowing your language gives you an inner strength and pride in your heritage. "ki-ká-nihta-néhiyawihinin ki-ká-sohki-téhiyan mina ká-kístéyimotín ki-t-aniskomakíwin." In the old days we used to respect everything… This isn’t done today, that’s why we are lost. "kíyaté-mana kahkiyaw kikway ni-kí-kistéyihtamak… ékwa óma anohc namowiya ékohsi itócikatwéw, ékoci óma éyakohk ésa ká-wanisiniyak." Love one another and help one another. Be truthful and respectful in our speech, which in itself is a miracle and a gift from the Creator, that we might use it only to speak good of each other and pass on the good things of life. "óma ka-píkiskwéyák ta-kí kistéyihtomowak mina ta-kí-tapwéyak, éyako áyamiwin mitoni mamáhtáwisíhcikéwin óma ki-mámawóhtawímawánaw ká-kí-miyo-miyikowak, ka-tahkaki- píkiskwatówák ékwa mina ka-miyo-aniskowinimak pimatisiwiwina." 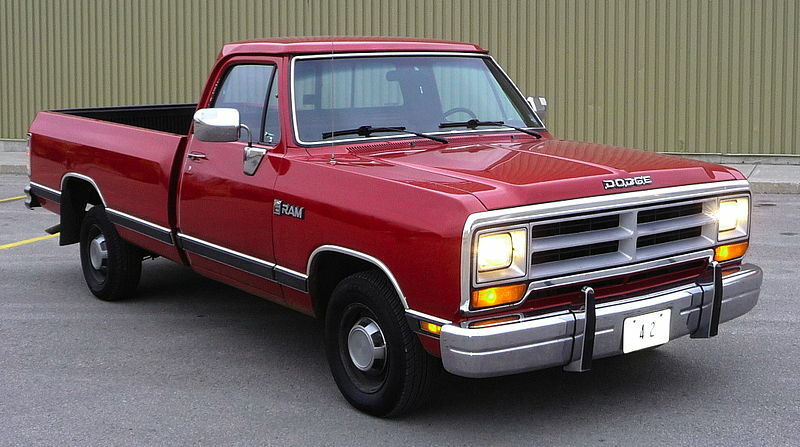 This is the Starblanket family pickup truck. 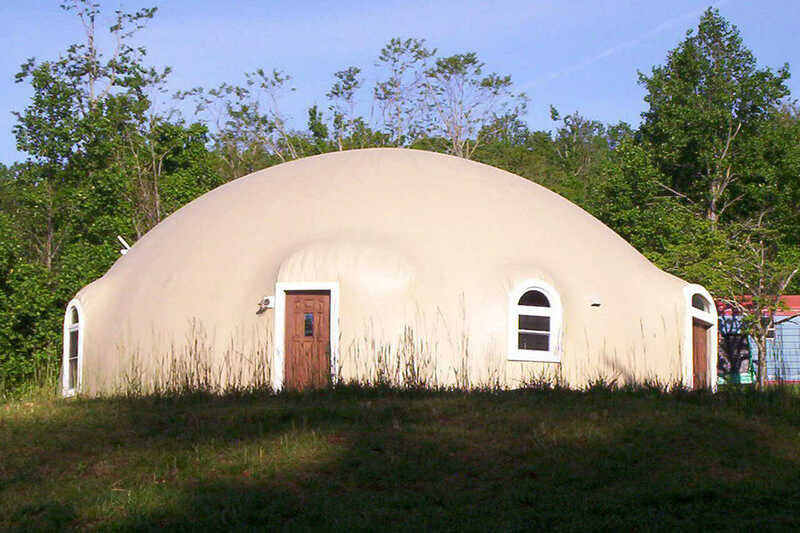 Many Tongues lives in a roundhouse designed to accommodate a wide range of disabilities. See the floor plan. 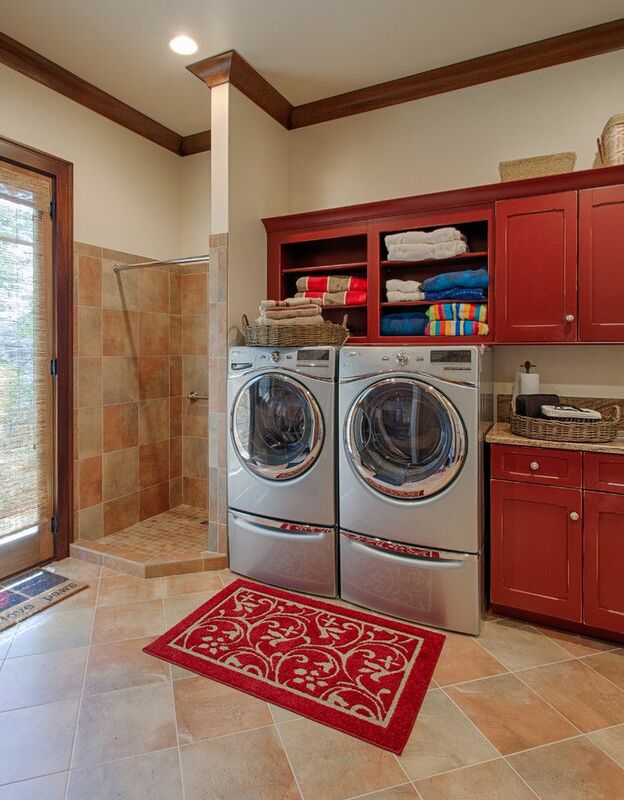 The laundry room has a sink with kneespace, a washer and dryer, and a shower for washing dogs, equipment, or other things. 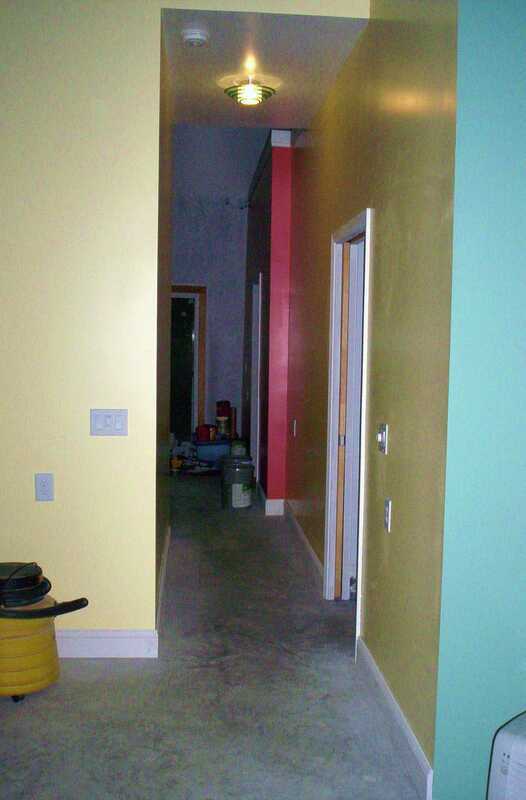 Bright colors break up spaces, making it easier to identify doors and corners. 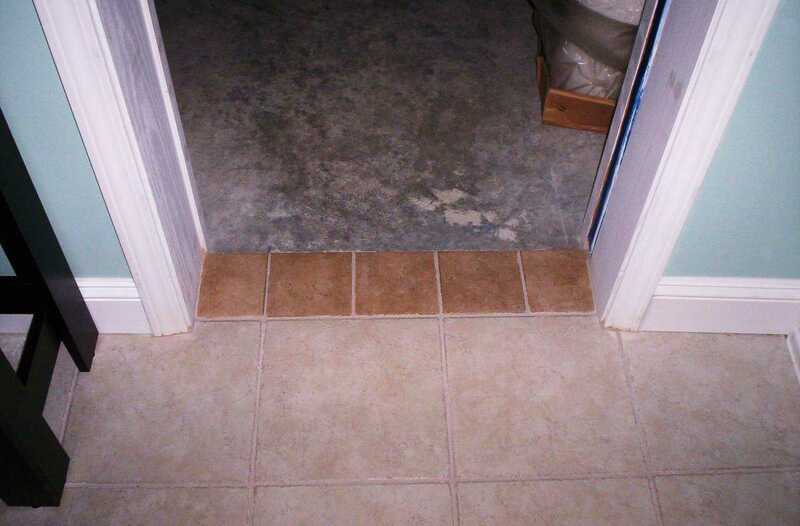 Smooth concrete floors and 36" wide hallways allow comfortable travel by wheelchair. The 9' tall ceilings make the halls look narrower, though. Flat, high-contrast thresholds mark transitions without creating barriers. This is the door from the common bathroom into the hallway. The common bathroom has a bathtub, toilet, and sink. 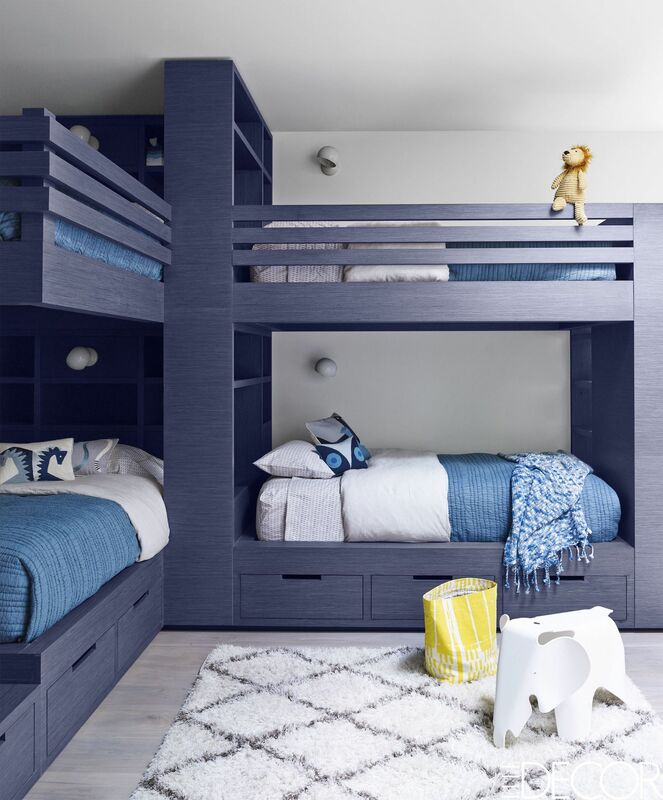 The bunkroom has four built-in beds for visiting children. 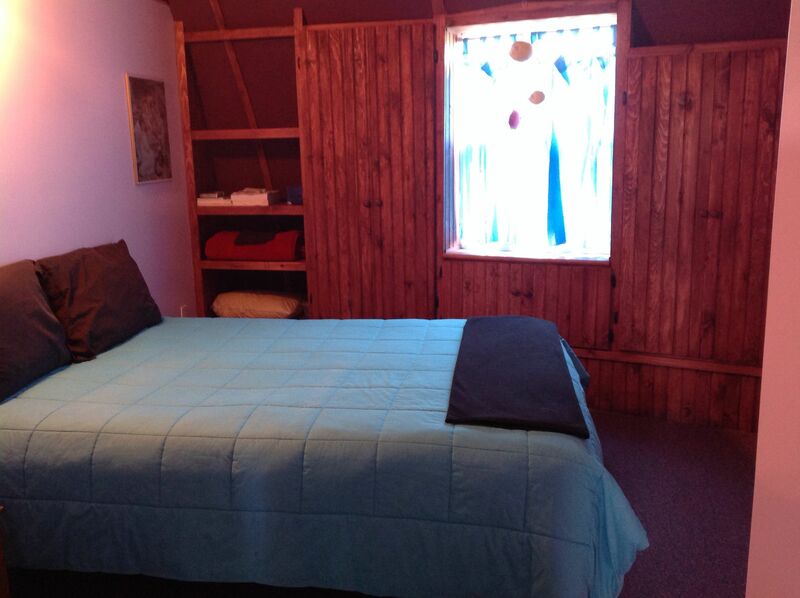 The guest bedroom has one full-size bed. The built-in storage along the outer walls was a project done by a teen cousin to practice woodworking. The great room includes kitchen, dining room, and living room areas along with a roll-in exercise center and a desk without a chair. 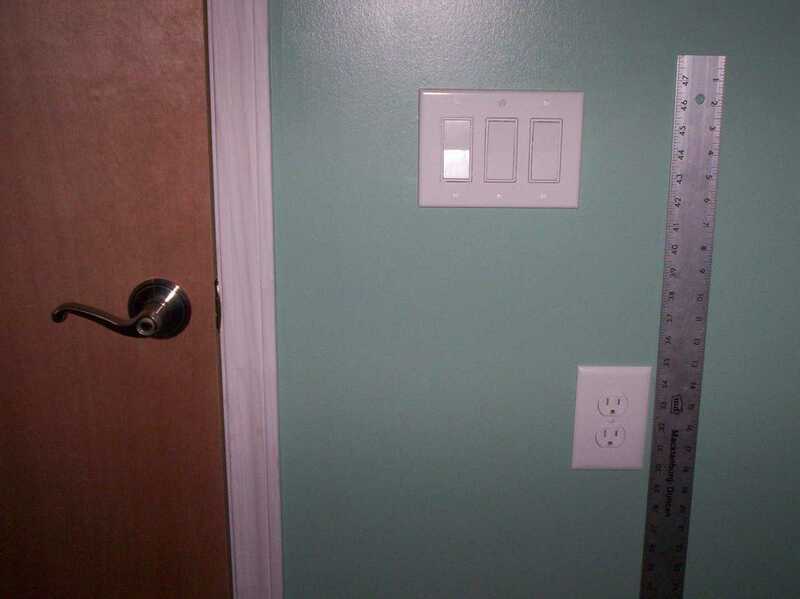 Contrasting colors of wall and trim, doors, switch plates, electrical outlets, etc. make it easy to see the different parts of the house. Lever door handles and rocker switches are comfortable to use, positioned about 30" above the floor for convenient reach. The study holds many books for all ages along with tables, chairs, and a pit group. Indoor-outdoor carpet in the master bedroom cushions the concrete floor without catching on wheels. 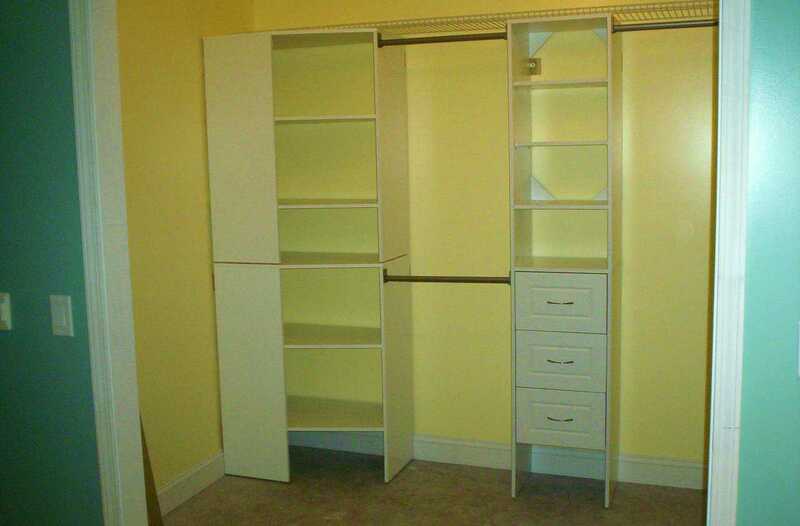 The closet in the master bedroom has plenty of low storage as well as high storage. Many Tongues rotates his clothes seasonally, storing off-season items up high and current ones within easy reach. Friends and family help him move the clothes every few months. 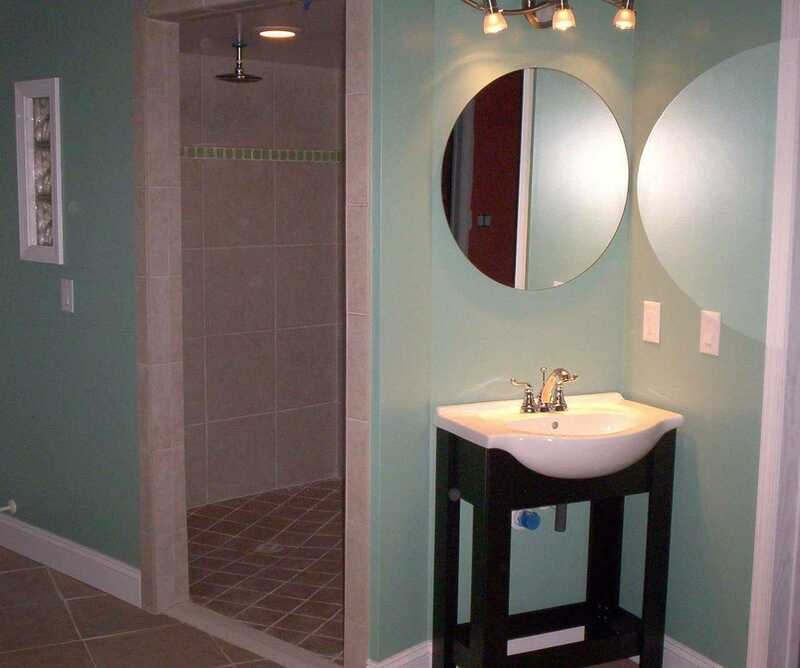 The master bathroom includes a sink, shower, and toilet. 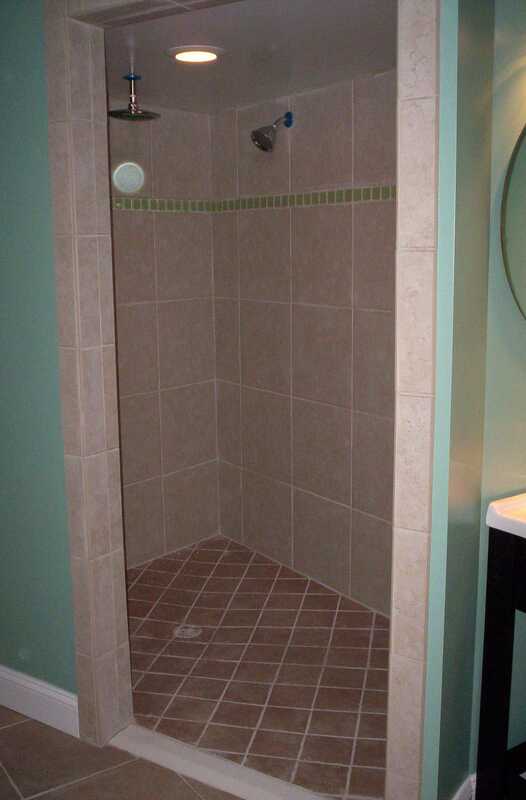 The roll-in shower has a fixed showerhead and rainshower visible here, and inside the wall to the left, it also has a showerhead on a hose above a built-in bench. Grab bars are on the walls near the bench, not visible from this angle. Intentional neighboring balances everyone's strengths and weaknesses. Windtalkers is a tribal term for codetalkers. Story hides record history. They use picture writing to tell a story. See some pictures with people and nature. They can be rolled for storage. Here are a student worksheet and a teacher guide for a lesson about them. Browse some more lessons. Note: Plains Cree tends not to use capital letters, so I stuck with lowercase letters in this poem. Here are some books. Little Cree Books has a number of titles for young children and other language learners. These are available variously in English and Plains Cree. They also have some basic lessons. You can tell time without a clock. To make a timer with shadows, set up your gnomen, mark the current position of the shadow with a rock, and place a second rock a short distance sunwise (clockwise) from the first one. With practice you can learn to estimate how fast the sun will travel. A meaningful apology consists of several parts. Understand how to apologize. Teaching kids to apologize is a part of parenting, but not everyone learns it. Forcing people to apologize just teaches lying and manipulation; instead, encourage them to express their feelings and offer practical recompense. A reduced penalty is another incentive for sincere apology. 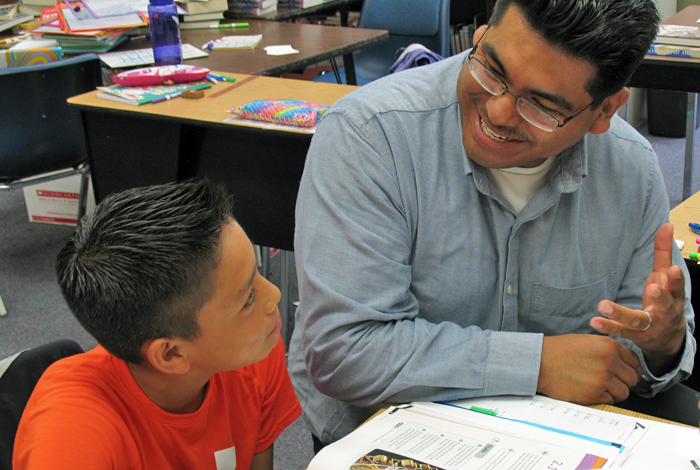 Positive discipline includes the premise that "discipline teaches, punishment hurts." There are tips and techniques for positive discipline, some of which work fine at all ages. 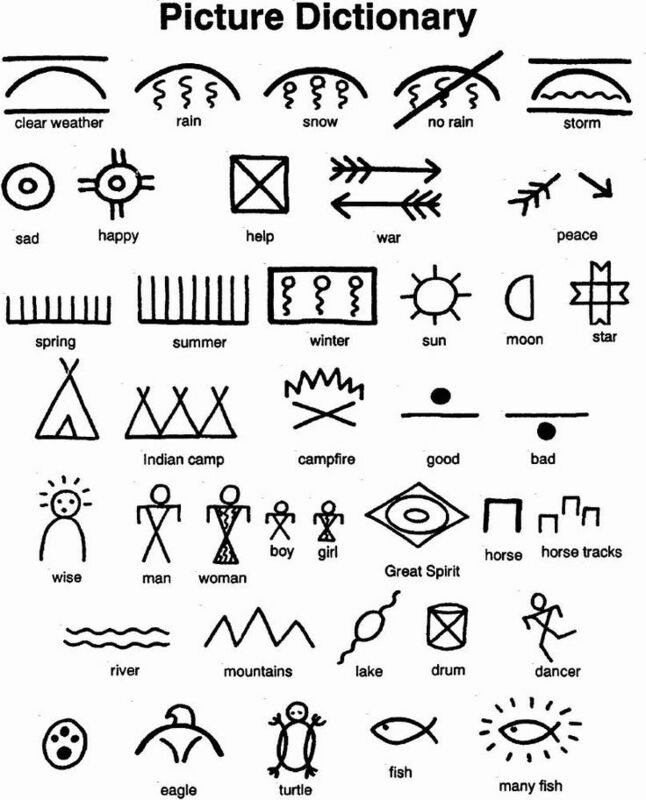 Tribal cultures traditionally practice similar methods.